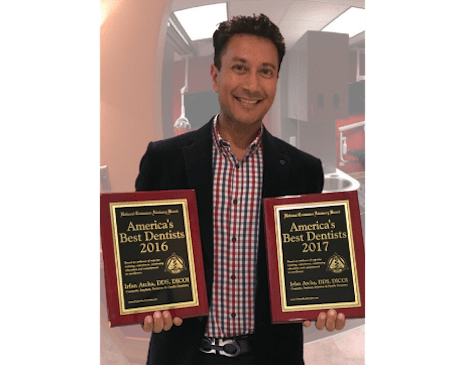 Irfan Atcha, DDS, DICOI, DADIA at New Teeth Chicago Dental in Chicago, Illinois is a board-certified general dentist and a nationally recognized expert in dental implants, cosmetic dentistry, and sedation dentistry. Dr. Atcha not only completed his undergraduate degree at the University of Illinois at Chicago in Chicago, Illinois, but he also received his DDS degree from their college of dentistry. Following this, he continued to keep up-to-date with the newest and most advanced technologies through completing more than 1,900 hours of post-doctoral training. Some of the continued training he’s received has been in the Malo Clinic-All-On-4 dental implants and advanced IV sedation training. He bases his practice on building quality relationships with his patients by giving all patients the time they need to have all their questions addressed so they understand all their treatment options. Dr. Atcha prides himself in making sure every patient receives first-class treatment and achieves a million-dollar smile, which enhances their self-confidence and self-esteem. His commitment to providing the highest value of care from the moment you open the doors to New Teeth Chicago Dental is evident through his patients’ impressive reviews.